After nearly a month at the box office, Steve Jobs is as successful as the original Mac (which was hyped to sell a million units in a month and sold, at its lowest, a paltry 500). Better in conception and hype than preliminary delivery. To date, Steve Jobs has earned just $9.8 million in four weeks. But alas, it's a good movie. Dawn, Lauren, and I enjoyed it. It revolves around contrived backstage dialogue preceding three product launches in 1984, 1988, and 1998 respectively. It's no Social Network, but again, rat-a-tat-tat dialogue from Aaron Sorkin keeps it putting along. Fassbender et al. do great jobs. I suppose the major disappointment, if there is one, is that so much of the film is fiction. Sorkin made this clear throughout every interview he gave during its press tour and, to me, that's crazy. 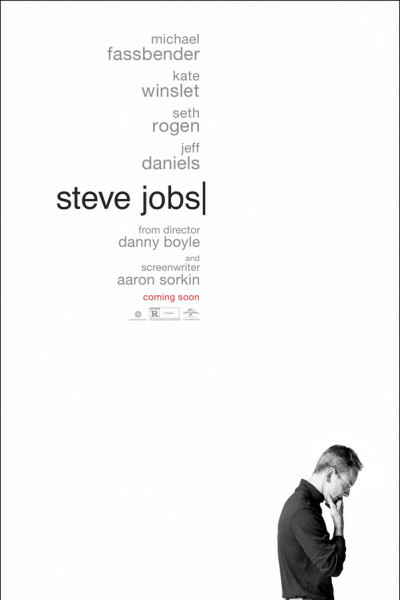 Seems to me, in light of Jobs' rich life, and Walter Isaacson's great work (among so many others'), the least Sorkin could have done would have been to ground the film in truth, making it a flat-out biopic, not a contrivance. He proudly interviewed dozens of Jobs' acquaintances, friends, co-workers, partners, virtually everyone. Then, proceeded to fictionalize 85% of the subject matter. That's bonkers, wanton and, perhaps, a storytelling travesty. He's done it so often now that I, personally (despite enjoying his dialogue), am losing confidence in his credibility. I'm not quite sure why one would take a life, so well-documented, public, and worthy on its own merits, and then ignore and replace it with make-believe. C'est la vie. "All in the name of art," I suppose. As it is, "ho hum."